When someone is JUMPING, RUNNING, or DROPPING objects in the room above you, there are a lot of noise bring produced. This noise, mostly known as “Transmission Noise” is one of the hardest noises to stop. The wood framing is very conductive, so the transmission noise that comes from that person above you passes through very easily. Your ceiling drywall is rigidly attached to this vibrating framing, so once the vibration enters your ceiling, it goes directly to the drywall and then into your ears! Impact noise that is caused by people running, jumping and dropping objects on the floor above your home, doesn’t just effect one room, but possibly multiple rooms and/or your whole house. Impact or “Transmission Noise” is like the epicenter of an earthquake, the epicenter being the point of the noise. It will be the strongest as it moves through the floor. When traveling, it will slowly reduce. This is the most difficult type of noise to stop due to the different ways it travels and comes through your ceiling. The vibration of the impact causes the noise to travel throughout the ceiling and walls. Though treating the ceiling will damping a high percentage of the noise, the transmission noise still can get to your room due to the vibration going down your walls. 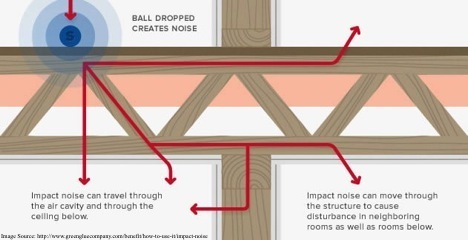 Different homes experience different impact noises due to the way the home was built. Due to many different techniques and materials used to create walls and ceilings, every house, room, and wall is different. It is known that metal studs have less transmission noise than wooden studs. A home with wooden studs compared to metal studs have a higher chance of transmission noise getting to other rooms and traveling farther than a home with metal studs. So if you have unwanted sounds from the people above or the neighbors nextdoor to you, or are building a theater room, or a play room, etc, remember that impact noise just doesnt come from your ceiling, but can be coming from your walls also. Impact noise as well as airborne noise will always be there and is very hard and very tricky to stop, but there are various levels of reducing the noise. Like always, proper soundproofing during construction is always the best. When retrofitting, depending on the layout of the rooms and /or the building, you can only reduce the impact or airborne noise within the room. For more information on how to retrofit your room to help with the noise, please call (781) 710-1261 or EMAIL us today and set up a consultation. We’ll come over to your home and go over the various levels of soundproofing that will help reduce the unwanted noise.